This page may require cleanup to meet basic quality standards. The specific problem is: consolidate fixes. You can help by modifying the article. The discussion page may contain useful suggestions. The retail game cannot be installed on 64-bit computers; see Issues fixed. Bonus stages may be impossible to complete at 60 FPS; see Frame rate capping. Animations are capped at 30 FPS. Does not support Alt+Tab ↹ while in-game; see Windowed or Game breaks after task switching. 8.12 "Display initialisation error problem during resolutions enumeration"
8.14 "Graphics Dll not found, run install"
Original retail version. Has SafeDisc DRM[Note 1]. Rayman 3-pack version, also includes Rayman and Rayman M.
10th Anniversary, also includes Rayman M and Rayman 3: Hoodlum Havoc. Patches are available here. Note that the digital versions have the CD issue fixed, but it is unknown if they have any other patches applied. Use nGlide and force MSAA in the graphics card control panel or SGSSAA in Nvidia Profile Inspector. Use nGlide. Set in nglide_config.exe. Animations only run at 30 FPS.. Frame rates higher than 30 can cause calculation issues. 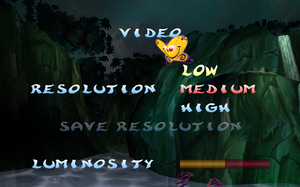 Download and extract the Rayman 2 Widescreen Patch pack. Navigate the folders for your game version and desired aspect ratio. Place the files into <path-to-game>, replacing the old ones. Make sure your resolution settings are set to fit the screen (set in nglide_config.exe). For resolutions greater than 2048 pixels, use dgVoodoo 2. Set the game to Glide mode with nGlide. Click on Input tab, set Hook dinput. Run the game from DxWnd. Windowed mode in some cases can be forced by pressing Alt+↵ Enter, but task switching may still not work correctly. Use Rayman 2 Input Fix on modern systems. Some commands are not bound to the gamepad. This is side effect of the way Rayman 2 checks the available resolutions when using the Glide renderer. Setting a forced resolution in the nGlide settings minimizes the effect. Run nGlide Configurator from the start menu. Select your screen resolution. Change Aspect ratio to Fit to Screen if you want to play in widescreen, and click Apply. Run <path-to-game>\GXSetup.exe (causes screen to momentarily flicker). Change Renderer to Glide2 (1.0.0) Voodoo Graphics Glide 2 Driver and click OK.
Run Rayman2.exe as an admin (causes screen to momentarily flicker). Download and extract the latest version of dgVoodoo2. Copy the contents of MS as well as dgVoodooSetup.exe into <path-to-game>. Click the ./ button at the top of the window. Click the DirectX tab and select your desired resolution. Disable the dgVoodoo Watermark option. Change Renderer to DirectX6 (1.0.0) DirectX 6 Driver. Select your resolution and click OK.
Run Rayman2.exe as an admin. Causes frame rate to jump between 30 and 60 FPS; consider capping to 30. White lines may appear on the edge of the screen when forcing MSAA. 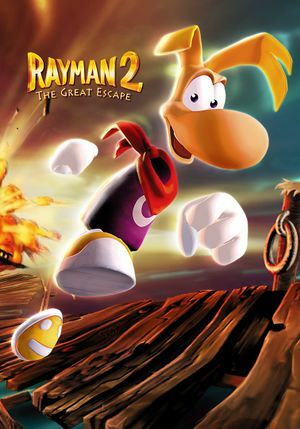 Copy GliVd1vf.dll from folder "Rayman 2\DLL" to folder "Rayman 2\DLL\Glide"
32 bit in ubi.ini works only with Glide renderer and after copying the file. nGlide automatically renders all Glide games at 32-bit, regardless of original bit-depth (though with x 16 instead of x 32 in ubi.ini, game looks slightly diffrent - slightly because the game itself has only 16 bit textures. Download the latest version of nGlide. Open the nGlide setup with 7-Zip. Extract the contents to the installation folder and overwrite the original files. During first minimizing, use ⊞ Win+Tab ↹, during second minimizing, use Alt+Tab ↹ and so on. In main menu (before loading save) use only Alt+Tab ↹. In case of using Aueral 3D, and closing version notification on startup, don't use Alt+Tab ↹ twice at a row (to come back to the game after closing notification, and later to minimize in main menu). Don't press on the game icon in taskbar more than once at a row. Game breaks can still occur though, but less. Alternating ← and → never fills the bar more than around 60%. The best DX6 wrapper performance for this game. Behaves smoother than dgVoodoo and WineD3D. No 30 FPS dips. Overlays cause major FPS drops (e.g. Fraps, Steam, Uplay, MSI Afterburner). It's just enough to hide them by keyboard shortcut if available, or just close. If you encounter blurry graphics problem, you may be forced to use Glide renderer with nGlide (or slower dgVoodoo) or Wine. In this case, AMD GPU drivers can be a culprit. Now GXSetup should list all renderers (useful for changing DX6 to (n)Glide and opposite, instead of editing ubi.ini). If only Glide is shown on the list, run GXSetup in Windows XP SP2 compatibility mode. The retail game cannot be installed on 64-bit computers because the DRM in the installation disc is 16-bit. At the end of The Echoing Caves an anti-piracy message will appear and stop progress, even when using a legitimate copy of the game. This has been fixed in the GOG release. You can copy your save file to that version and continue playing. Copy the DATA folder to the installation folder. Add a DEP Exception for Rayman2.exe. Sometimes reboot needed afterwards. Fixes the problem of crashing on Woods of Light and other levels loading. Extract the appropriate ddraw.dll to the installation folder. "Display initialisation error problem during resolutions enumeration"
"Graphics Dll not found, run install"
6 Retail default renderer (Uplay version is already preconfigured with DX6 ddraw WineD3D wrapper). 2 Needs to be set in GXSetup.exe or ubi.ini (GOG.com version is already preconfigured with nGlide). Adds first-person camera mode and other misc. mods. 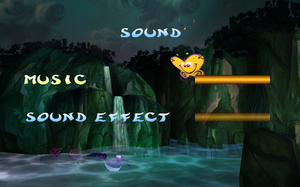 Level switcher for Rayman 2. ↑ 3.0 3.1 File/folder structure within this directory reflects the path(s) listed for Windows and/or Steam game data (use Wine regedit to access Windows registry paths). Games with Steam Cloud support may store data in ~/.steam/steam/userdata/<user-id>/15060/ in addition to or instead of this directory. The app ID (15060) may differ in some cases. Treat backslashes as forward slashes. See the glossary page for details. This page was last edited on 11 April 2019, at 22:22.